Although artificial colors and dyes have been used in foods since the early 1900’s, the FDA has banned many of them due to health concerns. 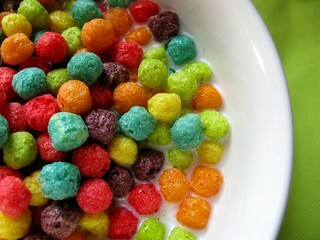 Thirty-seven artificial colors still remain approved for general food use in the USA, many of which are now prohibited in some European countries. Many of these chemicals have been researched and found to have harmful side effects, but they are still used in popular candies, soft drinks, cereals, and other processed foods. Americans are now consuming more processed foods and drinks than ever before, and therefore more artificial colors and dyes. Many scientists have researched these common chemicals and found shocking results. The most common blue 1 & 2, citrus red 2, green 3, red 3 & 40, and yellow 5 & 6, have been found to cause a wide degree of side effects. Some have been found to cause cancer, ADHD, neurochemical and behavioral effects, allergies and more. Because of link between artificial dyes and the frequently seen side effects of cancer and ADHD, many European countries such as Norway, France, Finland, The U.K., and Sweden have banned a number of these chemicals from their foods. It is no secret that these additives have harmful side effects, so why do companies still choose to use them? It is a very simple marketing tactic. “You eat with your eyes”, therefore companies will try to make their food look visually appealing to convince you to buy their products. Using artificial dyes and colors is just one method companies use to attract buyers. Artificial dyes like Yellow 5 have more vibrant and concentrated color than natural ones like saffron or turmeric. They are also much cheaper than natural dyes because companies do not need to use much in order to get the color they want. Artificial colors are also easier to use and their results are more reliable because they are much less sensitive to heat than naturally-derived food dyes are. This news may seem very alarming and upsetting to the average consumer, but there is hope. The FDA requires that companies put their ingredients on the food labels, so you know which foods are organic and which ones have artificial coloring. Research on artificial food dyes has led many consumers to cut out harmful processed foods and sodas from their diet and led to more awareness among buyers. And although there are companies such as Coca-Cola that use harmful cancer causing dyes such like 4-MEI, there are brands like General Mills that are promising to soon cut out all artificial dyes from their cereals by 2017. The new direction American consumers are taking now towards organic and health foods is slowly leading the food industry to change their foods in a healthy way. No longer are some food companies looking for the most vibrant look with their presentation, but rather the healthiest.